Heavy rain has been causing problems across Orange County Friday night and into Saturday. Orange Water and Sewer Authority crews responded to a wastewater overflow on Rogerson Drive around 9 p.m. Friday. “The cause of the overflow was a break in a wastewater pipe,” officials said in a release. Heavy rain moving through the area increased the amount of water in the utility’ wastewater system. Three overflows occurred in that area of Rogerson Drive since Friday night, officials said, each overflow lasting between one and three hours. An unknown amount did flow into a storm drain that enters Morgan Creek. OWASA officials said that crews are working to repair the broken pipe and anticipate that work being completed by Tuesday. State regulators were notified of the spill by OWASA. Meanwhile, Riverwalk and Gold Park in Hillsborough are closed due to flooding. Flooding also has forced closures of Eno Street between Allen Ruffin and Jones avenues and between Murray Street and West Hill Avenue. 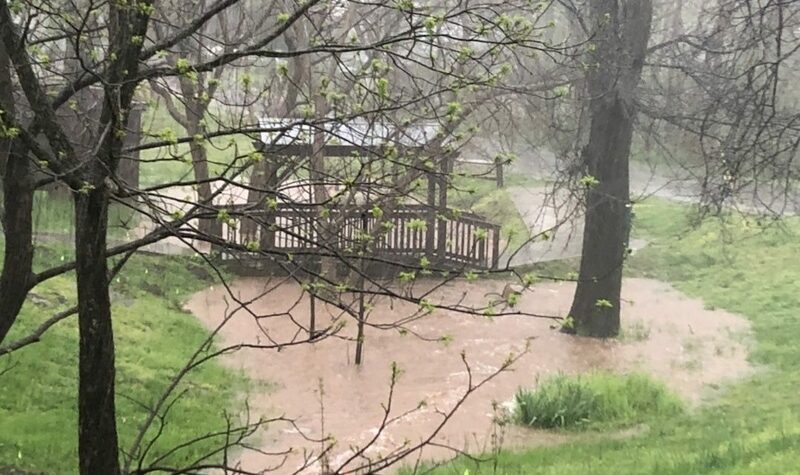 “Additional low-lying areas could quickly flood due to excessing runoff from heavy rains,” town officials said in a release.